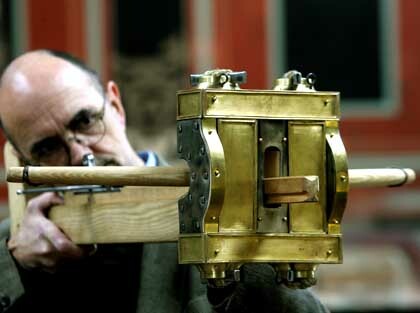 The extremely rare remainders of manuballista were found by the archaeologists in a pit grave near Xanten. "Some piece of metal were discovered as result of a targeted investigation due to an "archaeological sensation", said a speaker of the archaeological park in the Niederrhein city. The metal object relatively small, with a size of 28x21 centimeters, was the clamping frame of a feared firearm, which functioned similarly to a crossbow. In the metal frame the two arms of the cannon elbow were fastened with perpendicularly clamped rope bundles. Comparably well preserved similar items were found only in Iraq and Spain, explained the expert. While there however from nothing more it remained the felling trees hurrying the corrosion in the groundwater in this case ensured that the timber construction method inside the framework and even the castings of the rope bundles as well as some fibers would have kept. The reproduction shown in the picture has an "impressive striking power", which could have become strained with a hoist, explained the speaker. The unusual find is shown for the first time starting from 12 March in the exhibition at the Römisch-Germanischen Museum in Cologne.